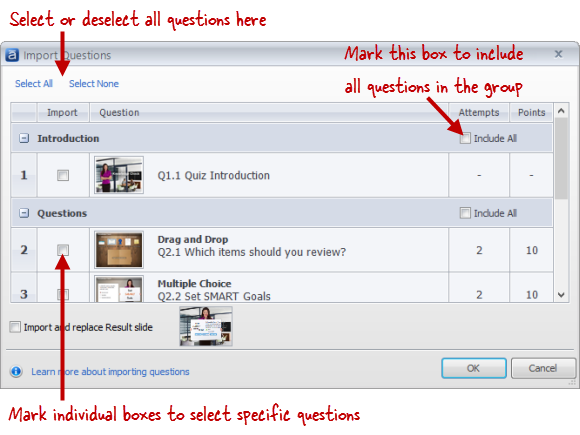 You can import questions into Articulate Quizmaker to save development time. This is helpful when you need to reuse questions from another quiz or when a subject matter expert (SME) drafts questions for you. Open an existing quiz, or create a new one. 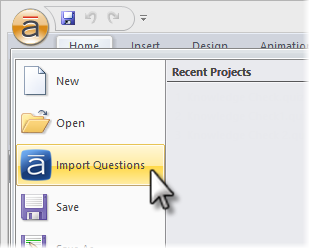 Click the round Articulate button in the upper left corner, and select Import Questions. In Question List View, go to the Home tab, and click Import Questions. Browse to the quiz that contains the slides you want to import, and click Open. Quizmaker displays a list of slides from the quiz you selected. Mark the slides you want to import. If you want to import the result slide, be sure to mark Import and replace Result slide in the lower left corner. Click OK to complete the import process. Browse to the quiz template that contains the slides you want to import, and click Open. Quizmaker displays a list of slides from the quiz template you selected. Mark the slides you want to import. Tip: You can also start a new quiz directly from a quiz template without going through the process of importing questions. See Creating and Using Articulate Quizmaker Templates. Tip: See this article for an interactive version of the Excel template. Browse to the Excel spreadsheet (XLS or XLSX) that contains the questions you want to import, and click Open. 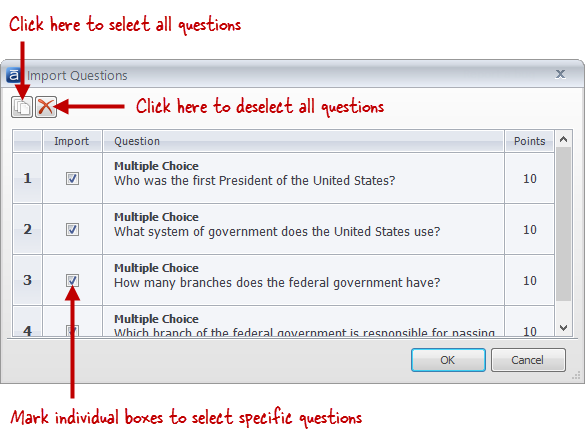 Quizmaker displays a list of questions from the spreadsheet you selected. Mark the questions you want to import. If there are any errors in your spreadsheet, Quizmaker will display an Import Errors window, listing each error. Correct the errors, and import again. Formatting in your spreadsheet will be removed during import (italics, font size, hyperlinks, etc.). Only questions in the first worksheet (tab) of your spreadsheet will be imported. Additional worksheets will be ignored. Questions will be imported into the question list after the currently selected slide or, if a slide isn't selected, at the end of the quiz. The more questions you import, the longer it'll take to process and create them in Quizmaker. Browse to the text (TXT) file that contains the questions you want to import, and click Open. Quizmaker displays a list of questions from the text file you selected. Mark the questions you want to import. If there are any errors in your text file, Quizmaker will display an Import Errors window, listing each error. Correct the errors, and import again.